NECC 2006 filled San Diego with close to 17,000 excited educators last week and WebQuests, as usual, were part of the conversation. WebQuests: A Mechanism for Adapting Technology Professional Development. 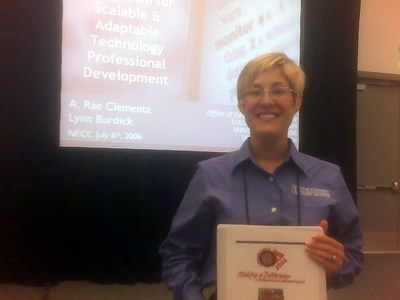 The binder she's holding is part of a very creative staff development camp she and Lynn Burdick designed in WebQuest format. It's called A Moveable Feast IX and it just concluded today. The WebQuest that organized participants' activities can be seen here. This use of WebQuests should inspire anyone putting an inservice effort together. Great stuff! My One Year of QuestGardening: A Crop Report had a crowd of over 300. I covered some of the statistics of the past year and looked ahead to future developments. QuestGarden has over 29,000 registered users in 114 countries! They've created over 14,000 WebQuests so far and the growth is accelerating. See the slides for more details. These numbers are amazing. Do you have any general statistics on webquest use (e.g. how many teachers use webquests in their classrooms)? It's a library of educational sites, broken down by grade level and topic. Sometimes I find it easier to browse through a library like this one rather than try and sift through Google results.